On the list of things we’re supposed to do but generally don’t, nothing ranks higher than eating well. And no wonder, considering that they keep changing the rules on us. Margarine was once supposed to be better than butter  until it turned out to be worse. Low-fat eating was supposed to be the way to lose weight  until it was low-carb, then back to low-fat again. Now the rug has been pulled out once more. It turns out that making healthy food choices is not exactly as straightforward as it sounds. In fact, when restaurants include low-fat, low-calorie choices on the menu, they may be making us more likely to choose wrong. What’s more, it’s people who rank high in self-control who tend to make the worst eating choices of all. These unlikely findings are the result of a paper that will be published in the fall in the Journal of Consumer Research. The study was conducted by a team of investigators from three universities who did their work in the most straightforward way possible: by offering subjects unhealthy foods and healthy foods and seeing what they chose. The participants were then presented with various opportunities to consider and choose different foods. In the first round, they were given a simple menu that included only three items: chicken nuggets, french fries and a baked potato. To eliminate the confounding variable of money, the researchers told the volunteers that all items cost the same. People generally agreed that the fries seemed like the least healthy choice, and no surprise, those who scored highest in self-control were the least likely to choose the food. After that group left, another one was brought in and offered the same three choices, but this time a salad was added to the mix. In this case you’d expect the self-controlled folks to stampede for the greens  but that’s not what happened. 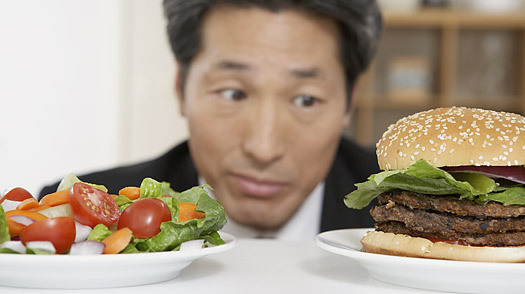 Wilcox and his collaborators repeated the study two more times with different foods: for one it was a bacon cheeseburger, a chicken sandwich and a fish sandwich, with a veggie burger thrown in later as a ringer; for the other it was fudge-covered Oreos, plus two other types of Oreos, with a 100-cal. Oreo packet later added to the menu. In each case, the folks who rated high in self-control did a good job of making the healthiest choices they could  until a truly healthy option was presented, which is when they fell completely off the wagon. Wilcox thinks the mechanism at work here is what’s known as “vicarious goal fulfillment.” People who excel at self-control are very good at remaining mindful of an objective and keeping it in focus. When that goal is, say, finishing a term paper, they outperform other people at ignoring distracting options like going to a movie. When that goal is eating well, they’re better at resisting distractions like ice cream and pizza. But when a virtuous choice is actually made available, the goal may feel fulfilled even when it hasn’t been. Once they have that illusion that theyâ€™ve satisfied their healthy-eating goal, they give themselves permission to indulge. “They fail to activate their real goal-fulfillment reaction in response to the threat,” says Wilcox. It’s not only people with high self-control who slip up this way  and that can lead to real problems. In the real world, menus contain a lot more than just four options, and anyone confronted with a plate of greens may be tempted to plunge even deeper into the high-calorie, high-fat wasteland that lies beyond mere french fries and Oreos. What’s more, vicarious goal fulfillment plays out in subtler ways too. People who are mindful about staying active and working out often notice that on days when they’ve gone to the gym, they’re more inclined to let themselves slip at night, eating desserts or other foods they’d normally pass up. The phenomenon is akin to the exhaustion of self-control  that is, one act of self-control weakens your ability to commit to another. For example, people who never touch a drop of alcohol during the week may be more inclined to go nuts on weekends, or someone who successfully resists buying a new jacket one day may be twice as likely to spring for a pair of shoes the next. As with all behaviors that seem hardwired into us, the best solution  maybe the only solution  might simply be to remain vigilant. “This tendency evens out across the whole population,” Wilcox says, “so everyone should watch out.” Just when you think you’ve got the bad foods figured out, it seems, they pull you back in.